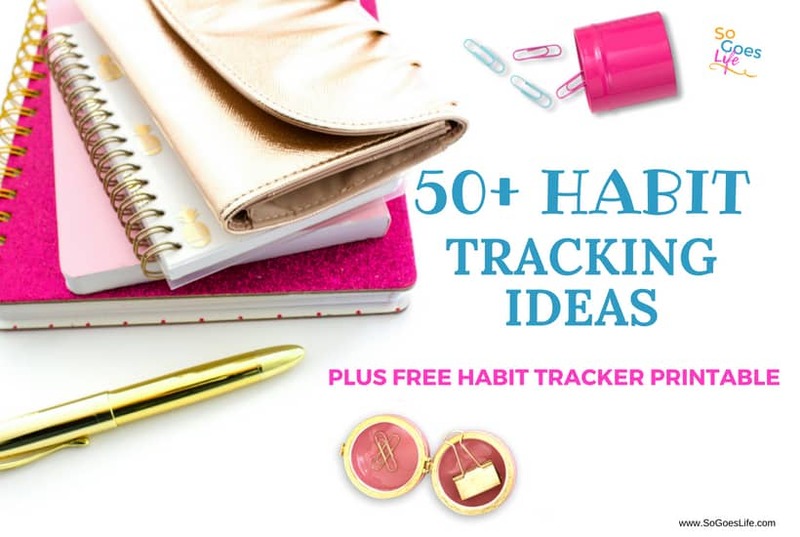 I love using habit trackers. I seriously think they are the best thing next to sliced bread. I know dorky, but seriously, when I’m tracking my habits I am successful. When I’m not tracking them, I fail miserably. I’ve discovered that accomplishing my goals is directly tied to setting daily habits that will help me achieve my goals. Do you struggle to get basic tasks done on a daily basis? I do! I feel like I’m constantly playing catch up and struggling to keep myself organized. Here is the deal, when you are tracking your daily habits you are constantly aware of what you need to be working towards. Habit trackers are my secret recipe for getting stuff done. If you have struggled with goal setting in the past, I highly recommend finding some habits to track. Start out small and then as you become confident in your ability to make positive habits (or break negative ones) then start expanding. You’ll quickly find you can accomplish anything you set your mind too. Creating a Daily Habit Tracker is super easy. In the past, I purchased graph paper notebooks and created simple tracking sheets. You can also use bullet journals. If you are looking for something super simple you can download my Free Positive Habit Tracking Printable Worksheet If you want to learn more about creating positive habits visit this post – How to Create Positive Habits. 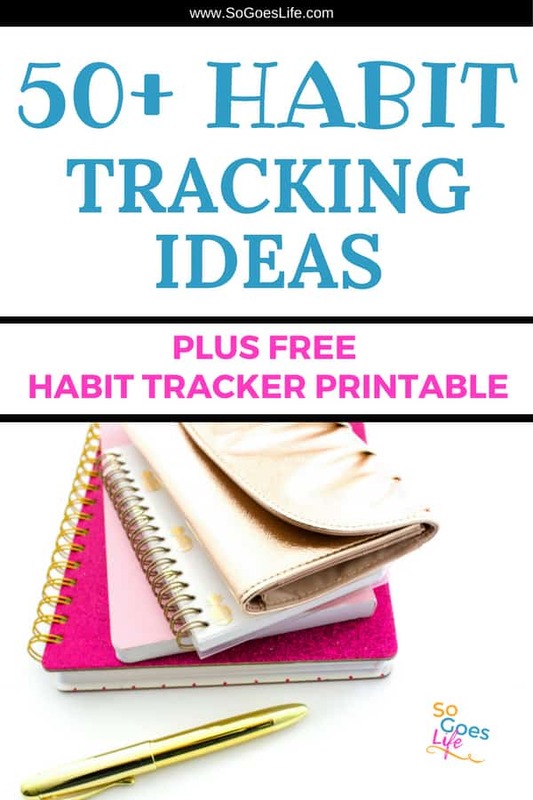 Below is a long list of habit tracker ideas. Take a few minutes to review this list and then find 5-8 items that you feel will have the most impact on your life and start tracking them. Do you struggle with getting to bed on time? Start tracking your pre-bedtime habits. Do you struggle to exercise? Start with a simple 20-minute goal to exercise each day. Do you struggle to stay off social media? Start tracking how frequently you log into your accounts and then make a goal to reduce the number. Learning to track your habits will help you reach your goals. I know it sounds totally simple, but I promise that if you give it a try you’ll be pleasantly surprised. I’ve been focusing on limiting my Facebook and Twitter times to specific times of the days and doing less than 30 minutes a day. I used to be a semi-decent pianist, but I can hardly play anymore because I never remember to practice. I’ve found that I need to give myself 15-20 minutes of me time each day to stay sane. Did you go to bed on time? Sleep in? Get more than 7 hours of sleep? I do this in conjunction with my meal planning since I’m trying to focus on cooking at home more. Most people have a specific item they are trying to avoid like soda, coffee, energy drinks, chocolate, alcohol, junk food. Most of these are more of a weekly or monthly task to track. There are literally thousands of things that you can track when you are trying to create positive daily habits. I can guarantee, this list is just the tip of the iceberg. If you are into bullet journalling habit tracking is a great tool to add to your journal. Download my habit tracking forms, or create your own and start tracking your daily habits. I know it sounds dorky, but seriously tracking my habits has changed my world. I get so much more done when I’m actively tracking the little things in my life that matter and that I’m trying to improve on. Use this habit tracking list of ideas to jump-start your brainstorming session. I promise you won’t regret it!